Times change. There was a time when this reviewer wouldn’t have had any truck at all with an electronic book. I have to admit to still having reservations, but certainly on this occasion I have to say the merit in the project is obvious. I should perhaps start by saying that this ‘review’ is in truth more in the nature of an announcement than a considered review, but such is the level of credit due to writer Derek Carlaw and all at the ACS who have made its appearance possible I feel obliged to draw this one to the attention of the wider world at the earliest practicable moment. The mission statement is that Carlaw has set out to write biographies of every man who has appeared for Kent since 1806 and this, Part One, takes the story up to the outbreak of the Great War in 1914. It is a huge, sprawling work that, had it appeared in print, would no doubt have proved prohibitively expensive. With Kent’s long history there are a total of 524 biographies in Part One. A few are relatively brief, 300 words or so, but generally they are longer than that and the bigger the name the longer the essay – that concerning the great orthodox slow left armer ‘Charlie’ Blythe runs to more than 7,000 words. In the limited amount of reading I have managed to date I have much enjoyed two profiles in particular. The first is that of Cuthbert ‘Pinky’ Burnup, by all accounts a man who got close to an England cap. Burnup’s is a name I have always known as he was a member of the supporting cast in the first piece of cricket writing I ever read, an essay on Lancashire cricket by Neville Cardus in the 1951 Wisden. Having never forgotten the great man’s romantic recollection of Burnup to learn the full story of the man was particularly rewarding. The other essay I will specifically mention is that concerning Douglas Carr. A debutant for the county at 37 in 1909 the leg spinner’s rise was so meteoric that by the end of that summer he had been selected for what proved to be his only Test cap, the last of that summer’s Ashes contest. He took 7-282, rather overbowled by Archie MacLaren. As that briefest of summaries suggests Carr is an interesting character and one who some time ago I decided I wanted to write about. In one sense there is no shortage of source material. There is Wisden, Cricket – A Weekly Record and Lord Harris’s history of Kent cricket to name but three. I found other contemporary sources as well, and some later ones, but essentially they were all just repeating each other. I gave up in the end. It is obvious from what Carlaw has written that he found all the same references to Carr that I did, but clearly located a few more as well. His essay on Carr is an engrossing read, and testament to the rewards that can be secured by a writer who does more than scratch the surface and has the time, energy and inclination to drill down into what he finds. In terms of rounding things off I have to say this is the easiest decision to award five stars I have ever had to make. There are no photographs, no index and for the statistics it is necessary to link to CricketArchive and accordingly have a subscription to that. By definition there is no dust jacket, wrappers or even a proper title page, but none of those points really matter for this sort of project. 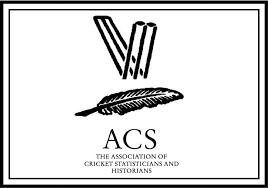 Kent County Cricketers A-Z of is a splendid publication that is available to all free of charge via this link. Those using it could also do a whole lot worse than linger on the ACS site a while in order to see what is on offer, and to sign up – at £29 a year it is excellent value. This week David reviews a book that I am unfamiliar with, but now will be keeping an eye out for a reasonably priced edition.